On behalf of the International Population Data Linkage Network’s (IPDLN) International Scientific Committee, we invite you to participate in the 2018 IPDLN Conference on 12-14 September, 2018, at the Banff Centre, located in beautiful Banff National Park, Alberta, Canada. With our theme, Linking Data – Improving Lives, we have created a forum for the presentation and discussion of research and innovation in the area of Linked Population Data Science and Policy Impact. We welcome the submission of abstracts for oral, poster, rapid fire and creative presentations. 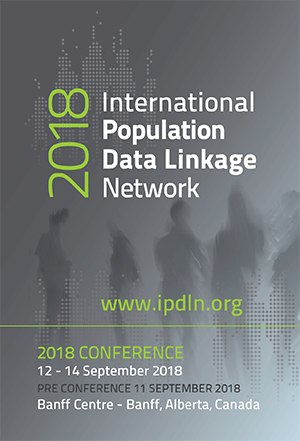 All abstracts presented will be posted on the IPDLN website, and published in the International Journal of Population Data Science (IJPDS), the official publisher for the 2018 IPDLN Conference. Review the conference rate card (PDF). Data and linkage quality: measurement, reporting, improvement, and managing bias; data interoperability, standards, etc. You will have the option to identify your preference of presentation format(s) for which you would like your abstract to be considered. Oral Presentations will be grouped by the International Scientific Committee into thematically related areas and presented in concurrent sessions. Each oral presenter will be given 10 minutes to share their work, and 5 minutes for Q&A, for a total of 15 minutes. Abstracts submitted for consideration as oral presentations will subsequently be considered for rapid fire or poster presentations if not accepted for the oral format. Rapid Fire Presentations will be presented during dedicated rapid fire concurrent sessions during the conference. Each presenter will have 3 minutes to present their work using only one slide. The presentation should focus mainly on results and impact or novelty of the findings. Rapid Fire presentation details will be emailed to those selected. Poster presentations will be on display at the conference. The viewing times and the schedule for the posters will be confirmed after the call for abstracts is completed and presentations are selected. Posters must remain on display for the assigned presentation day. Poster submission details and printing requirements will be emailed to those selected. The IPLDN Co-Directors and International Scientific Committee welcome creative and non-traditional presentations. These could include use of video, images, animation, live performance and other alternatives to simple slides with bullet points. Submitters opting for creative presentations should submit traditional format abstracts and indicate “creative/non-traditional presentation” using the check box in the abstract submission form. Creative presentations will be distributed across concurrent sessions, within thematically-related areas. There are limited spaces available for this format. Creative presentation details will be emailed to those selected. The online process will collect contact information regarding the presenter and co-authors, and sources of funding. It will also collect preference for oral, poster or rapid fire presentation, whether the presenter would like to be considered for a creative presentation, and whether the submission represents a student’s project. The abstract submitted should not exceed 325 words. Abstracts submitted to this conference should reflect original work. If questions arise about the eligibility of work for submission to this conference, please contact the organizers to discuss the details. Authors accept sole responsibility for the statements in their abstracts. Abstracts should be carefully proofread to avoid errors. Once the abstract has been submitted, editing can only be performed in exceptional circumstances by contacting the organizers. Accepted abstracts will be posted on the IPDLN website and published in the International Journal of Population Data Science. The 2018 International Population Data Linkage Network Conference will bring together a multidisciplinary audience of researchers in the general area of Big Data and its potential to improve health and society across the world. Proposals are invited for International Collaborative Sessions. The sessions are a formal item in the concurrent program, and will create opportunities to meet new peers, open up potential for new collaborations and discuss and document best practice across a number of areas of linked data science and policy impact. The International Scientific Committee is welcoming proposals for International Collaborative Sessions. The sessions are intended to support facilitated discussions around tractable issues and important topics, and must result in an output or outcome in the area of international data linkage. Sessions may include a short presentation or series of presentations; however more time for discussion is encouraged. Ideally, listed presenters/facilitators should represent more than one country/jurisdiction. Please note that these submissions will not be “blinded” of the presenters’ identities. Additionally, there may be opportunity for the International Scientific Committee to assign another facilitator to a session.